July 2006 was an exciting month here at 10,000 Birds, featuring not one but two highly productive cross-country trips.Â Business first brought me to the Bay Area, where I enjoyed cormorants at Cliff House, magpies on Mines Road, and avocets at the incredible Arrowhead Marsh.Â California birding is always revelatory, as are the swampy splendors of the Floridian Everglades. I tasted the fecund fruits of the latter at Loxahatchee NWR, Wakadohatchee Wetlands, and MacArthur Beach State Park in North Palm Beach. Not only were the birds outstanding, but I spotted the most psychedelic grasshopper imaginable. We had some good times closer to home as well. I started off the month by spotting my life Prothonotary Warbler with Corey at Jamaica Bay. Later in July, the Core Team repaired to Potter County for the 8th annual Chicken Inferno. 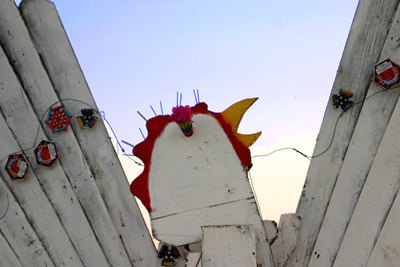 This year’s chicken was a creature of rare, rustic beauty, twenty feet tall and exquisitely combustible. Good times! Among our other assorted posts were my review of The Shorebird Guide and Charlie’s review of the Southern African Birdfinder. All in all, a fine month indeed.